Dishes like this are some of my favourite weeknight dinners. They’re quick, there’s a substantial hit of green veg and enough protein and chilli to keep my Irishman happy. There’s also only one pot so the cleaning up is quick too. Yay! 1. Heat a little oil in a large frying pan. Cook chorizo on a medium high heat until well browned on both sides. About 10 minutes. 2. Remove chorizo from the pan and place in a clean bowl, leaving behind as much lovely chorzio oil as possible. 3. Add the broccolini / broccoli to the pan with a splash of water. Cover with a tray or lid or foil and cook stirring every 5 minutes or so until the veg is bright green and tender with a little bit of crunch left. If it starts to burn add a little more water. 4. Return the chorizo to the pan and allow to warm. Squeeze over some lemon. Taste and season with salt and pepper and more lemon if needed. 5. Serve in bowls topped with pine nuts (if using). vegetarian – cook broccoli first in oil with a teaspoon of smoked paprika. Pan fry sliced halloumi and serve with broccoli, lemon juice and pine nuts or smoked almonds. vegan – cook broccoli first in oil with a teaspoon of smoked paprika. Add in a drained can of beans (white, red or black) and serve with lots of lemon, pine nuts and a good drizzle of peppery extra virgin olive oil. different veg – any greens are good here. Try kale, cavolo nero, collard greens, spinach, chard or rainbow chard. You could also use zucchini, asparagus or snow peas. more decadent – I love this served with a big dollop of home made aioli (garlicky mayo). hotter – add in a little chopped fresh or dried chilli with the chorizo. different meat – replace chorizo with other spicy sausages or chunks of bacon. carb lovers – serve with mashed potatoes or steamed potatoes tossed into the lovely chorizo oil. You could also serve with cooked pasta. more substantial – see the carb-lover options above or serve with some mayo, avocado or extra nuts (almonds are also great). You could also double the amount of chorizo. more substantial (low carb) – more chorizo. more veg – serve a green salad to serve. family friendly – use mild chorizo or other sausages + toss in cooked pasta. chorizo – fresh chorizo will need to be frozen. Dried chorizo will last in the fridge for a few weeks. Cryovacced chorizo will also last for a few weeks but any longer both will need to be frozen. broccolini / broccoli – will keep for 2 weeks or loner in the fridge. Can be frozen. Best to chop before freezing for quicker defrosting. lemon – will keep for months in a plastic bag in the fridge. pinenuts – keep them in the pantry. Tried this the other night and it was delicious. 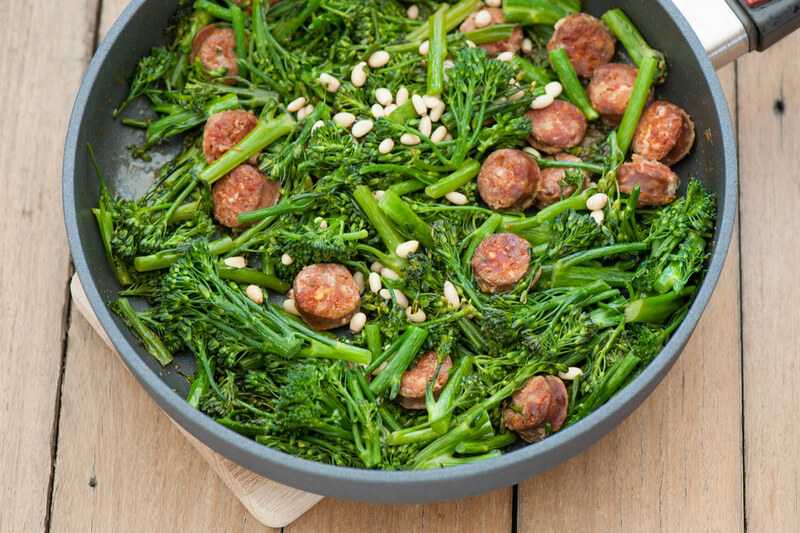 The chorizo left a good bit of oil, much more than I would normally cook my veggies in, but I decided to take a walk on the wild side, and went ahead and cooked the broccolini in all of it. The end result didn’t seem too oily & tasted great. (I was a little concerned that the “extra” oil might upset my husband’s stomach, but no worries!) Both my husband & I truly enjoyed it. I love the simplicity of your recipes, all the different flavors that I would normally not think to put together and all the variations you give. The variations & substitutions are a life saver for me, because I tend to think I have to follow the recipe exactly. I’m having fun trying new dishes, which I’ve been saying I’m going to do forever, but have just started to! Thanks!